We know, it's so hard to resist walking by any Cinnabon, especially at the mall or airport where your healthy food options are already limited. 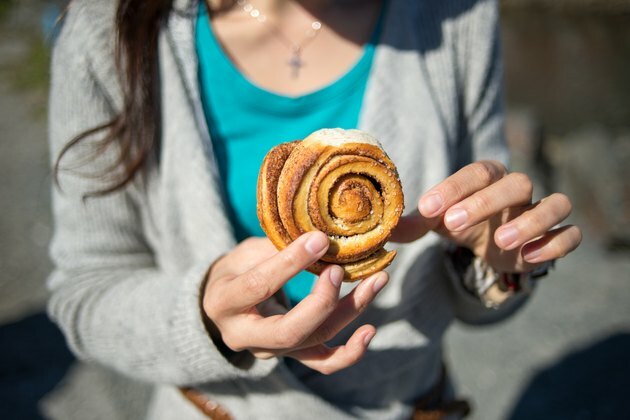 Just one whiff of the sweet frosted, melted cinnamon can draw you in. And once your nose has led you astray, you'll reason, "Why get the Minibon when I can order the motherlode, i.e. 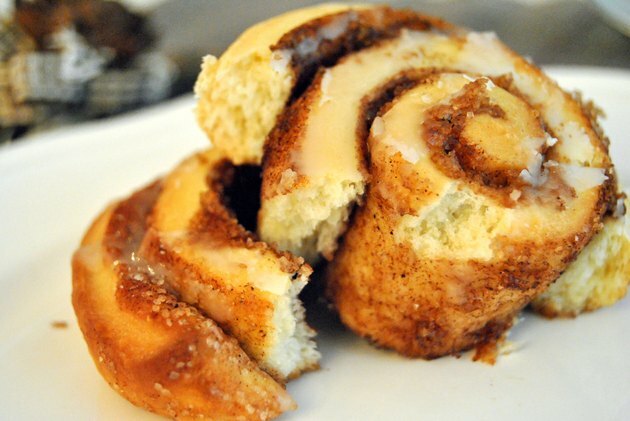 a Cinnabon Classic Roll and call it my morning meal?" At 880 calories, this sinister sweet roll is, unfortunately, actually more than one meal -- it's two! If you need to grab a quick breakfast at the airport, you're better off ordering a more satiating breakfast sandwich from Au Bon Pain, such as their Bacon and Egg Melt on Ciabatta, which contains 410 fewer calories than the Cinnabon Classic in addition to 28 grams of protein. One Cinnabon contains as much sugar as a 100 Grand chocolate bar plus nine Hershey's Kisses with almonds and 11 Pixy Stix! Skip the sugar-laden bun and avoid the horrific sugar crash that will surely follow just after you're finished snarfing it down! There Are a LOT of Calories, Fat, Carbs, Sodium and Sugar in a Cinnabon Classic Cinnamon Roll! THE DETECTIVES: Mira Calton and Jayson Calton, a husband-and-wife team whose book, "Rich Food, Poor Food," is the sequel to their bestselling "Naked Calories." The nutrition duo studied more than 150 ingredients in 100 countries on seven continents during a six-year expedition. NUTRITION LABEL: 880 calories, 37 grams of fat, 127 grams of carbs, 13 grams of protein, 58 grams of sugar, 820 milligrams of sodium, 2 grams of fiber. 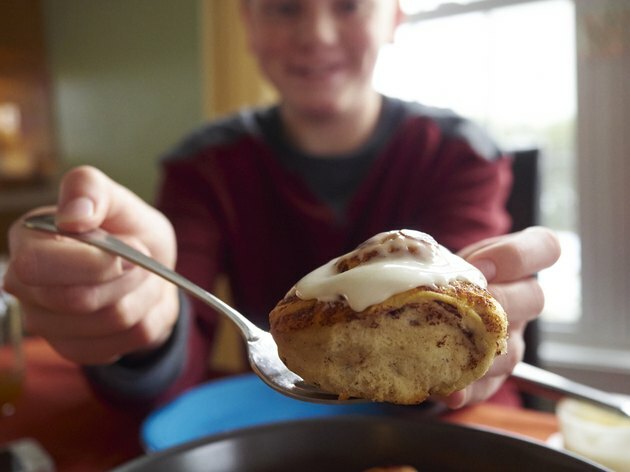 There Are a LOT of Ingredients in a Cinnabon Classic Cinnamon Roll! While Cinnabon lists the nutrition information on its website, it does not list the full ingredients list for any of its products on the company website. This seems a bit suspicious, no? For the Classic Roll, they describe it as "Warm dough filled with our legendary Makara® Cinnamon, topped with rich cream cheese frosting." But is that really the entire truth about what's inside that roll? *May also contain: Egg white, whole eggs, buttermilk, molasses, sodium stearoyl lactylate, buttermilk, azodicarbonamide, beta carotene, high fructose corn syrup (glucose-fructose), wheat protein isolate (wheat gluten lactic acid, sulfites), vital wheat gluten, hydroxpropyl methylcellulose, acetylated tartaric acid esters of mono and diglycerides (datem), baking soda, xanthan gum, guar gum, beta carotene, glucono delta-lactone, citric acid, propionic acid, enzymes (amylase), ascorbic acid sorbitan monostearate, cellulose gum, potassium sorbate, soy oil, polysorbate 60, lactic acid, artificial color. DATEM: The worst offenders in the bunch are the diacetyl tartaric acid esters of monoglycerides and diglycerides (or DATEM), which are emulsifiers that help extend the shelf life of processed foods. Doesn't sound so bad? Well, wait until you hear that they're basically trans-fatty acids in disguise. Because they're not technically considered a lipid or a fat, they avoid being labeled as such, thereby dodging the serious scrutiny that comes with trans-fats, which are associated with heart disease, stroke, obesity and diabetes. SODIUM BENZOATE: Another troublemaker is sodium benzoate, which is also used for preservation reasons. It may cause allergic reactions, such as hives and asthma, and may promote the formation of a carcinogen called benzene. AZODICARBONAMIDE: Unless you don't mind eating the same ingredient that's used in your yoga mat and sneaker soles, you'll want to avoid this additive. Its main purpose is to whiten the flour quickly. While its use is legal in the United States, azodicarbonamide is banned as a food additive in Europe in Australia. The Republic of Singapore also identifies azodicarbonamide as posing a health risk: The country banned this product, but it also invoked a serious penalty -- up to 15 years in prison and a $450,000 fine -- for using the asthma-causing allergen. SUGAR: As noted earlier, a Cinnabon Classic Cinnamon Roll is a straight-up sugar factory. Inside, you'll find 58 grams of sugar and four different types of the insulin-spiking sweet stuff: brown sugar, powdered sugar, high fructose corn syrup (glucose-fructose) and molasses. The worst part is that these sugars will rob your body of crucial vitamins and minerals, including vitamin C, chromium, magnesium, zinc and copper. To top it off, high fructose corn syrup infamously may not be triggering leptin, your “I'm full” hormone. In other words, you'll want to continue to stuff your face even if your stomach is completely full. NON-ORGANIC DAIRY: Made with cream, cheese cultures, whey and buttermilk, this dessert is likely packed with rBGH synthetic growth hormones, a treatment given to cows to boost milk production. These same cows are also likely given antibiotics to stave off hormone-related health issues, such as inflamed and infected udders. Consuming these super-charged cow byproducts may increase the human risk of breast, colon and prostate cancers. WHEAT GLUTEN (plus Vital Wheat Gluten): As first pointed out in the Caltons' earlier LIVESTRONG.COM investigation of the McDonald's Egg McMuffin, wheat isn't what it used to be. Today's genetically modified grains will not only spark an addiction (you'll want to keep eating more grains and sugars), but they will also encourage you to eat an average of 400 extra calories a day. Anther not-so-lovely perk of including this ingredient in your diet: It may cause a leaky gut, which can lead to immune problems and possibly arthritis -- not to mention the risk of developing a roll of your own (aka "a muffin top") from eating this sweet roll. GMOs: The Caltons count nine potentially genetically modified organisms -- including soy, corn and sugar -- in just one Cinnabon. OMG, that's a lot of GMOs! As a general rule, it's best to avoid GMOs whenever possible as GMO crops can be doused with pesticides that you will likely be consuming. 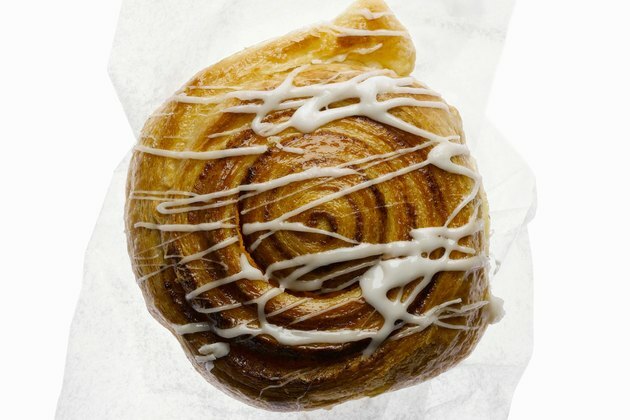 What's the Verdict on Cinnabon's Classic Cinnamon Roll? THE VERDICT: Guilty as sweet sin. THE SENTENCE: If you're thinking, "One Cinnabon Cinnamon roll every blue moon won't kill me," you're absolutely right. But consider this: Is it really worth poisoning yourself, even just a little bit? For a sweet cinnamon fix, consider sprinkling some organic cinnamon (cinnamon labeled as organic cannot be harvested from bioengineered plants -- i.e. 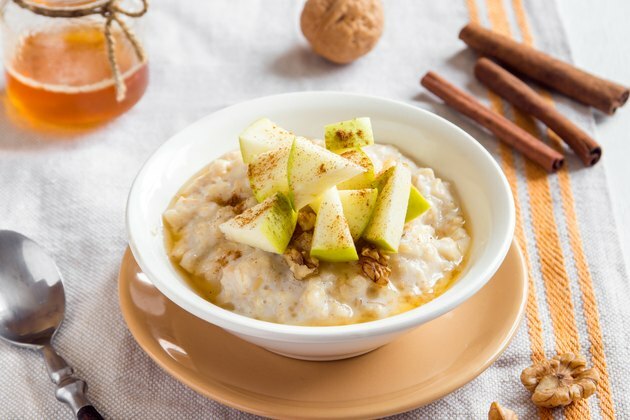 GMOs -- and it cannot be subjected to ionizing radiation), which is a good source of vitamins, minerals, and antioxidants, sprinkled over a plain or vanilla organic yogurt or oatmeal with some maple syrup and apples.